Hamburgers: They're so delicious, if the Hamburglar were to ever get caught, no jury would convict him. And in Charleston, we take them up a notch, with pretty much every restaurant in town making its own next-level version. 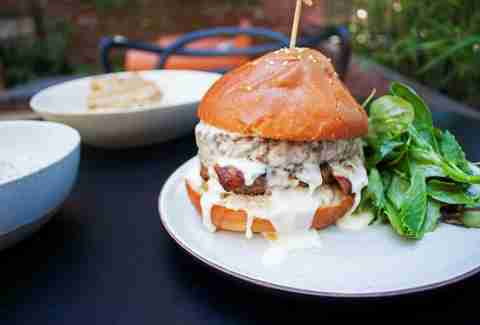 Here are the best burgers in the Holy City. The burger at Husk consistently tops lists of great burgers in Charleston (and America) because of its pure, delicious simplicity. Two Benton’s bacon-infused ground beef patties sit upon a house-made buttermilk & benne seed bun, topped with American cheese, diced white onions, bread & butter pickles, and a special sauce (and lettuce and tomato, when they’re in season). 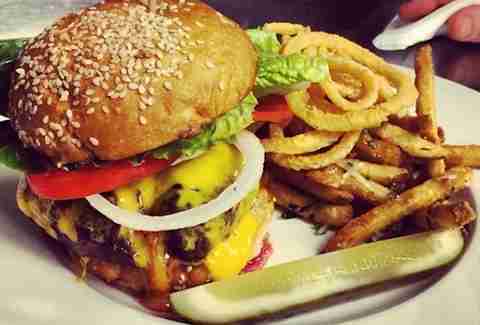 Very nearly the dictionary definition of a good burger, this is truly a work of art. 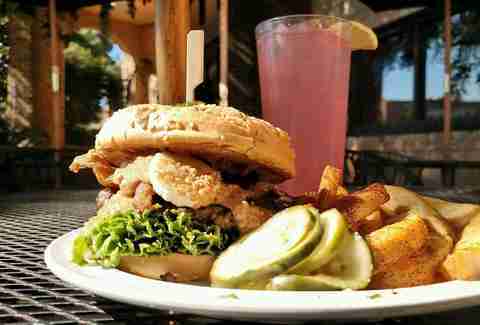 Make the trek out to Sullivan’s Island and you’ll find one of Charleston’s best burger joints -- Poe’s Tavern. People flock to the little house on Middle St for its fat half-pound beef pucks and delectable toppings on a brioche bun. The Amontillado is topped with guacamole, jalapeño Jack cheese, pico de gallo, and chipotle sour cream, and it’s perfect for those who like their burgers with a little kick. Found on the restaurant’s bar menu, Chef Matthew Niessner crafts the Halls Chophouse Burger with 10oz house prime ground beef (direct from the Allen Brothers out of Chicago) and cheddar cheese, then serves it with a generous helping of Parmesan truffle fries. Tucked into an unassuming strip mall in West Ashley, Charleston Sports Pub is something of a diamond in the rough. 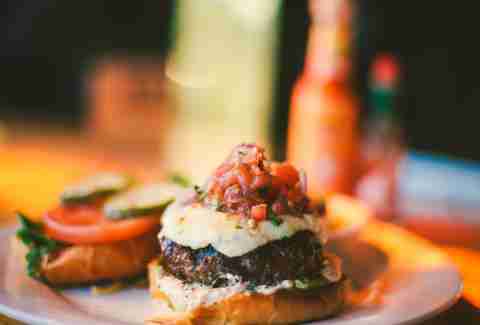 The menu is loaded with winners, but the Southerner burger is the shining star; it starts with a buttered bun and a seasoned half-pound of ground beef, and then gets some house-made pimento cheese, peach jam, and crispy bacon. You’ll love how the sweetness of the peach jam perfectly complements the creaminess of the pimento cheese (trust us). 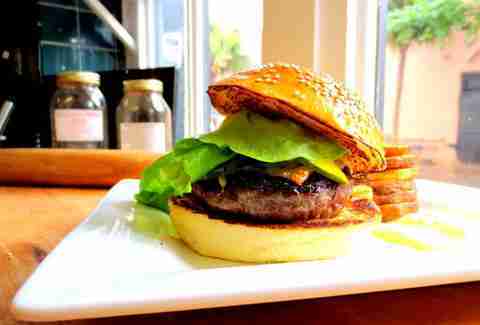 Everything Butcher & Bee touches seems to turn to gold, and its burger is no different. 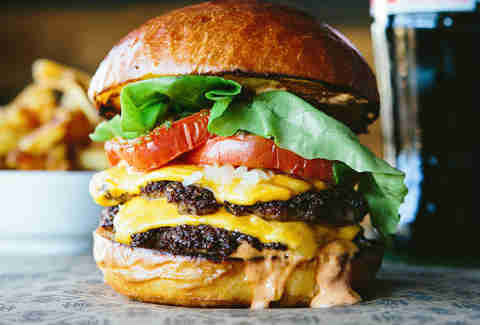 The burger is classically simple with two patties, American cheese, lettuce, tomato, onion, pickle, and secret sauce. What more do you need? 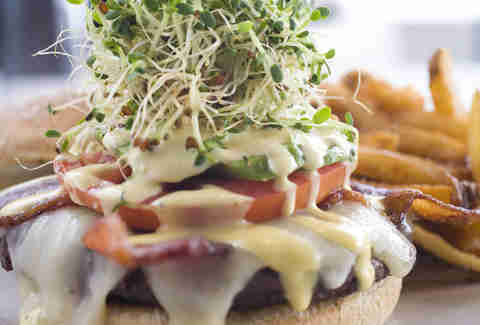 The California Burger from Coleman is topped with Monterey Jack cheese, pecan-smoked bacon, avocado, tomato, alfalfa sprouts, and creamy Dijon dressing (and add a couple of jalapeños if you’re feeling it). It’s a perpetual favorite among locals at this Mount Pleasant staple. This sucker would make Elvis proud. The house-ground beef is topped with healthy servings of homemade peanut butter and sliced banana, which come together in an unexpectedly delicious way. Try it with a side of fries and homemade ketchup. Sesame has a number of unique burger creations on the menu and will even do a duo of sliders for those of you who are indecisive. The guys at Moe’s know that putting an egg on anything instantly makes it a breakfast item, so for those of you who want an excuse to eat a burger at 9am, the Eye Opener is for you. 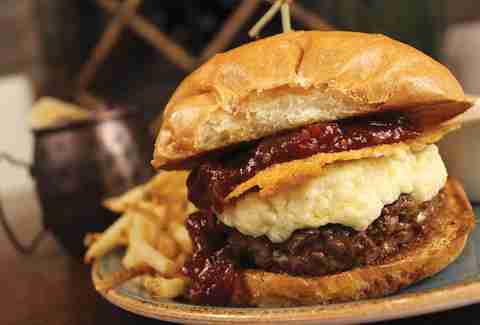 In addition to the fried egg, the hand-pattied ground chuck burger is topped with cheddar cheese and bacon to round out the experience. Prepare for New England on a bun -- this 6oz patty is topped with sharp white cheddar cheese, crispy bacon, thinly sliced Granny Smith apple, maple mayo, and arugula and is probably unlike anything you’ve ever tasted before. This is what it would look like if a cheeseburger and a French dip sandwich had a baby. 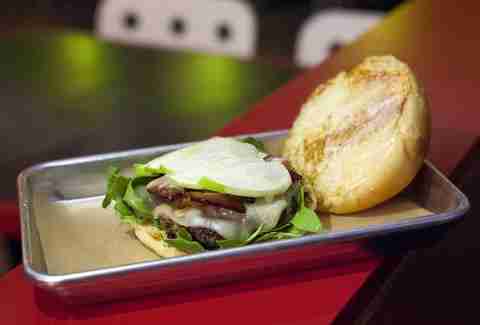 The house-ground patties are prepared daily and comprised of Angus chuck, brisket, and short rib. It’s all then deliciously topped with white cheddar, tomato jam, candied shallots, and a Parmesan crisp. Available exclusively on the Sunday brunch menu (and in limited quantities during happy hour), Chef Keeler's double cheeseburger -- a recipe he brought over from the beloved (and now-shuttered) Two Boroughs Larder -- is a classic. The double batty cheeseburger is topped with mornay cheese sauce, bacon, Thousand Island dressing, and pickles on a soft sesame seed bun. Pro tip: You can also add an egg to it at brunch, if you're feeling frisky. 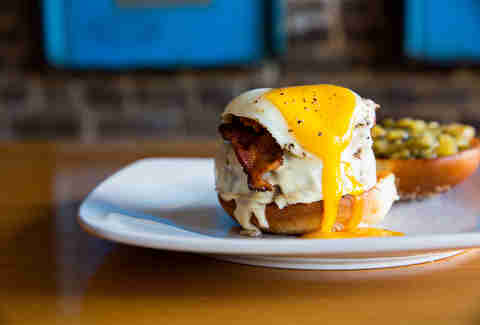 You don't often find a patty melt on a breakfast menu, but at Rarebit -- King St's upscale diner -- you'll be glad you did. This beauty consists of two Angus patties, pressed flat, topped with American cheese and caramelized onions on rye toast, and although it doesn't come with any sides, you'd be remiss if you didn't pair it with the amazingly creamy macaroni & cheese or house-cut fries. The full breakfast menu is available 'til the wee hours of the morning (1am), making this perfect for a late-night pick-me-up. 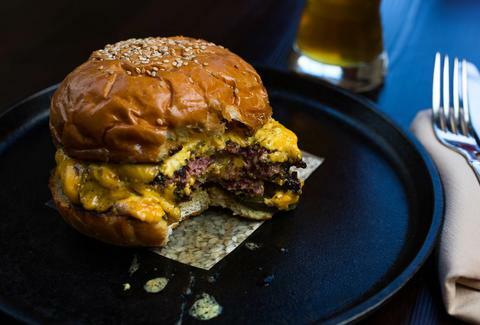 HoM (pronounced like "home") is famous for two things: ping pong and spectacular burgers. The burger menu changes seasonally and features a number of non-beef options for those who prefer to forgo red meat. If you're carnivorously inclined, a favorite on the beef menu is the HoM Wrecker burger, topped with crispy bacon, pepper Jack cheese, green tomato chutney, and a sunny-side-up egg. 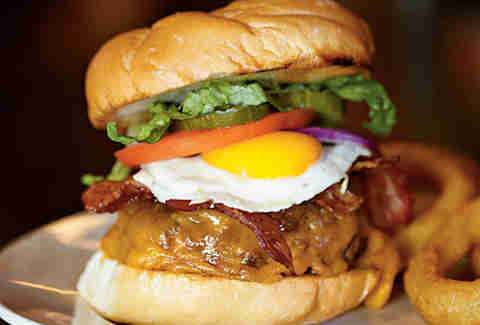 Charleston Burger Company features more than 22 signature burger choices on its exhaustive menu. Each burger is made with Certified Chuck Angus Beef that's ground in-house daily and served one of two ways: "chargrilled" over an open flame or "smashed" on a flat-top grill. You also have your choice of bun -- sesame kaiser or brioche -- meaning the ways to customize burgers here are pretty damn endless. 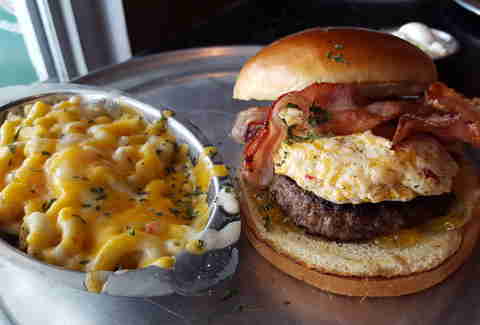 One burger stands out from the rest, however: the Mac Attack, made with applewood-smoked bacon and a heaping scoop of house-made macaroni & cheese. Definitely not for the faint of heart. While Craftsmen has a number of tasty burgers on its menu, one that's always a crowd-pleaser is the CKT Burger, made with ground beef chuck and pork belly, then topped with smoked Cheddar, Bibb lettuce, and beer pickles on a sesame seed bun. Be sure to stop by on Tuesdays for $6 burger night, and pair your burger with a beer from one of 48 taps on the cheap. 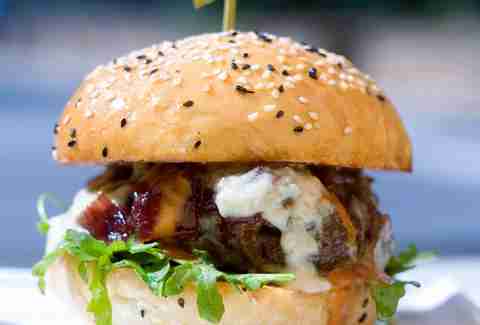 Chef Jamie Lynch's signature 5Church lamb burger by itself is worthy of a visit to the Market St staple. 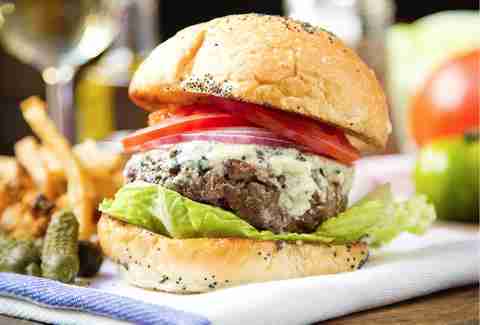 The burger is made with red onion marmalade, Gorgonzola fondue, arugula, and secret sauce on a house-made sesame bun, and served with a side of hand-cut fries. One bite is enough to explain why Chef Lynch did so well on the most recent season of Top Chef. If you think it's sacrilegious to order a cheeseburger at a French restaurant, go ahead and think again, because the burger at 39 Rue de Jean is legitimately delicious. The 10oz patty is grilled to order, with your choice of Roquefort, Gruyere, or Cheddar cheese, and served with a side of pommes frites. Sacré bleu! Sydney Gallimore is a food writer from Charleston, South Carolina who likes nothing more than a juicy burger and cold beer. Follow along with her foodie adventures on her website, Queen of the Food Age.